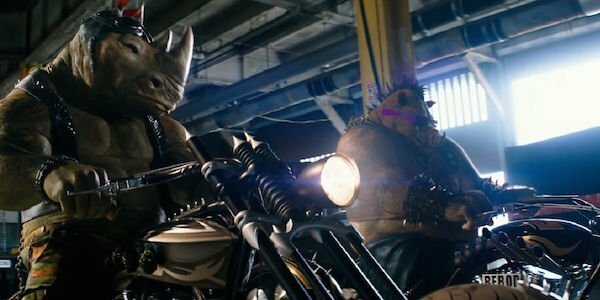 Fans were excited to find out that Bebop and Rocksteady were going to be appearing in Teenage Mutant Ninja Turtles: Out of the Shadows. It was the first time the characters will be in live-action, and it was a sign that the movie would embrace more of the spirit of the original 80’s cartoon. Now a new clip has been released of the classic Shredder goons undertaking their famous mutation. Pieces are cut out of the clip to avoid spoilers, but it gets the idea across. Shredder (played by the re-cast Brian Tee) needs some mutant muscle to combat the Turtles after they beat him senseless in the first film. It looks like he’s gotten his hands on some mutagen and recruits Baxter Stockman (gleefully portrayed by Tyler Perry) to make it into a weapon. It’s unclear how the human versions of Bebop and Rocksteady initially get involved in all this, but they seem more than happy to donate their bodies for science. What follows is a Cronenbergian transformation sequence while Shredder and Stockman look on; it doesn’t look too comfortable for them. The two henchmen seem pretty pleased by their transformation and not at all horrified. Personally, I’ve always felt that Bebop got the raw end of this deal. Rocksteady gets to be a rhino – which has obvious uses – but he get’s stuck as a warthog. He doesn’t really get any cool animal powers like a horn or a shell. Maybe he’s got super farts like Pumbaa? Then again, it doesn’t seem like Bebop has any problems with it, so why should I? Teenage Mutant Ninja Turtles: Out of the Shadows looks to be a celebration of the 80’s cartoon and the roots of the Turtles. Not only do you have Bebop and Rocksteady, but Casey Jones, Baxter Stockman, and Krang are all premiering in the new film series. Combine that with the humor seen in the trailers, the Technodrome, and the redesigned Shredder, and then you’ve got what could be a solid TMNT movie. Teenage Mutant Ninja Turtles: Out of the Shadows finds the four titular brothers Leonardo, Donatello, Raphael, and Michelangelo trying to save New York City from an alien threat, as well as the return of the Shredder with his own plan for revenge. The film is directed by Dave Green and stars Pete Polszek, Alan Ritchson, Noel Fisher, Jeremy Howard, Stephen Amell, Megan Fox, Will Arnett, Laura Linney, Tyler Perry, and Brian Tee.